Whether it’s Woodstock or Halloween, The Hippie Pants with Belt set will get you in character for your next 60s themed event. 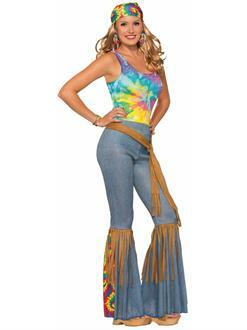 Includes a pair of bell bottom pants with tye dye designs and fake leather fringe, along with a matching fake leather belt. Comes in a variety of sizes and ships fast when you order on our online store!